11/92 David Mumpower A historically unprecedented exercise in cathartic venting creates a singularly unique voyeuristic experience. 29/126 Kim Hollis Captivating look at some extraordinarily strong, creative personalities. A documentary about a rock group struggling with their own failings has become the subject of cinema lore thanks to Michael McKean, Christopher Guest and Harry Shearer. Movie goers are now faced with a different reality, though. What if This Is Spinal Tap were real? Metallica: Some Kind of Monster is exactly that movie, but without the funny. Unless you were born without eyes and ears, you will have at least a passing familiarity with the rock group, Metallica. The multi, multi, 90 times multi-platinum band includes guitarist and vocalist James Hetfield, drummer Lars Ulrich, guitarist Kirk Hammett, and bass player Robert Trujillo. The band used to include Jason Newsted, but his recent departure from Metallica has created some rifts. This documentary is an exploration of those very same rifts along with many of the other daily hassles of being so squarely in the limelight of celebrity. 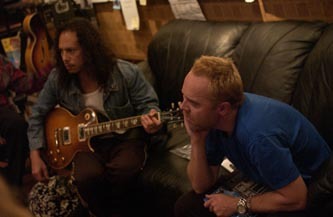 The film will depict the trying times involved in the recording of St. Anger, Metallica's first studio production in five years. In the middle of these sessions, Hetfield is forced to seek counseling in rehab after some brutal self-evaluation during group therapy. What's unique about the proceedings is that the group therapy only occurred at the behest of the band's management, who feared that Newsted's departure was the first sign of the band splitting up for good. When confronted with his own demons, Hetfield leaves the group during the middle of recording in order to try to save himself. All of this is captured on film for the audience to voyeuristically witness. The documentarians for the project, Joe Berlinger and Bruce Sinofsky, are best known for their work on the Emmy Award-winning Paradise Lost. That project focused on the West Memphis Three, a trio of allegedly murderous, devil-worshipping teenagers. The documentary demonstrated that the situation was not as black and white as local law enforcement officials tried to paint it to be. In the process of researching the story, Berlinger and Sinofsky grew acquainted with members of Metallica. The band was even gracious enough to allow their music to supplement the movie's proceedings for gratis. The eventual result of this relationship is Some Kind of Monster. The shoot faced any number of difficulties, but the most interesting tidbit is that the filming was initially paid for by Metallica's record label. Once Hetfield vanished, there was a request made to use the footage to turn the band into the next Ozzy Osbourne. The aging rock star had recently supplemented his music legend status by becoming a doddering old fool of a father on MTV. Since so many of the Metallica outtakes were flattering, an assumption was made that the band would manage to retain and enhance their cult status while working through troubling times.